When a nappy bag is made by someone who actually uses a nappy bag, it’s obvious. 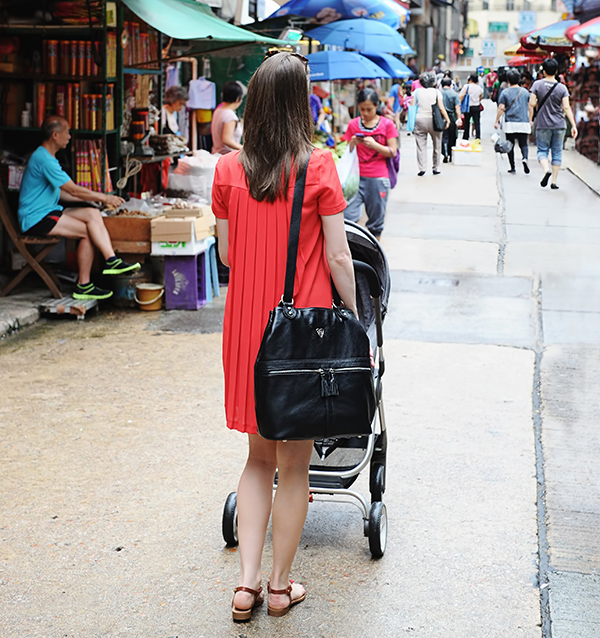 Anyone can put in pockets for wipes or a bottle, but when you’re going to be carrying the bag for the next two years or more, you want something really versatile that’s made for you as well as the baby. The Colby bag (£195) from Coco Bow by Motherknot is one of those dream bags where the designer has thought of everything. It can be worn as a shoulder bag, tote or, my new obsession, a grown-up leather backpack. The lining is removable and turns into yet another bag so you can pack it with baby gear, hand it off to a carer and continue on to work using the outside shell. Versatility isn’t this bag’s only superpower. It’s so gorgeous. The pebbled, supple black leather is chic but also super hardy so it can take the unique kind of beating only a baby can give. Think spilled food, getting stepped on, being dragged through the wood chips at the park. This bag can handle it. We love the tassel zips on the front pockets and the Celtic Motherknot emblem that represents the unbreakable bond between mama and baby. This bag is functional, pretty and has a little something to pull at the heartstrings. Colby hits stores in September 2015. You can pre-order online, and huzzah! They ship to Australia.